Tomato soup is nostalgic. It always has been. When the aroma of tomato soup fills my apartment, I am instantly taken back to my childhood kitchen table dunking a grilled cheese sandwich into my piping hot bowl of soup. This recipe is creamy and full of tomato flavor. Made in the crock pot, it has a combination of tomatoes, veggies, broth, milk, cheese, and herbs. For those who prefer to make this dish on the stove, I included directions below. Plenty of the ingredients in this soup are of the “already in your pantry” label. Feel free to make this soup as velvety smooth or as chunky as you like. 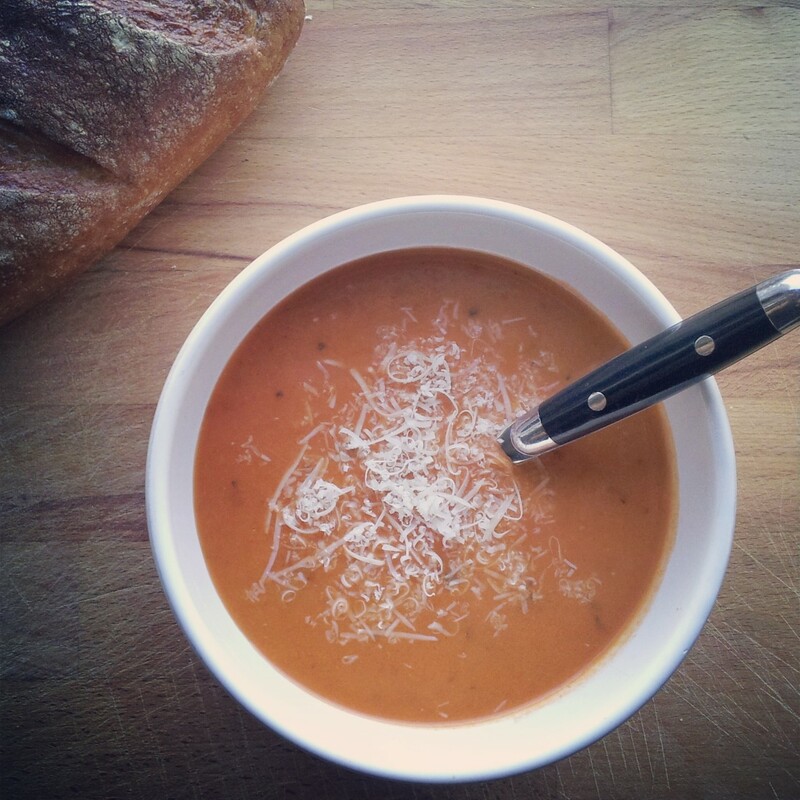 Once you make homemade tomato soup, you will never go back to the canned stuff! A quick tip I use for getting this soup in my crock pot before work in the morning is to buy a tub of pre chopped mirepoix (onions, celery, and carrots) from Trader Joe’s. A real time saver! Make this recipe soon. Don’t forget the grilled cheese! Nostalgia awaits. Add 1 tbsp butter to a large skillet over medium heat. Add celery, carrots, onion, and garlic. Cook for 5 minutes stirring often until lightly golden. Remove from pan and add to crock pot. To the crock pot, add tomatoes, thyme, basil, chicken (or vegetable) broth, cheese rind (if using), and bay leaf. Cook on low for 6-7 hours. Remove bay leaf and cheese rind (if using). Puree with an immersion blender until well blended. If you do not have an immersion blender, a blender or food processor will also work. In a large skillet, melt 2 tbsp butter over low heat. Add flour and stir constantly with a whisk for 3-4 minutes. Slowly whisk in 1 cup of the reserved hot soup. Add warmed milk and half & half, and stir until smooth. Pour into the slow cooker and stir until well incorporated. Add grated pecorino romano cheese and adjust seasoning with salt and pepper. Cover the crock pot and cook on low for 30 additional minutes. Stove top instructions: Follow instructions as is, and cook on the stove top for 1-2 hours (instead of in the crock pot for 6-7). Puree with immersion blender, make flour and milk mixture, add mixture to stove top pot, add cheese, and cook for an additional hour.